My doctor has just put me on some medication for panic attacks, some tablets called buspirone. Is it OK to dive and take these tablets or should I wait and see for when I come off them. There is no actual problem in taking this particular medication and diving, but the bigger question here is how well the panic attacks are controlled. I'm sure you understand the implications of having a panic underwater, not just for yourself but your buddy too. If your GP has decided that your condition is bad enough to warrant this sort of treatment, then I think it is better you don't dive until whatever is causing the attacks has been alleviated. Most people usually begin to get panics because of job, money, relationship or accommodation difficulties. If any of these are the causative factor, then when you are on top of these and panic free it is will be fine to dive again. However if you are one of those people that gets a panic attack for no real reason then I suggest diving is not the thing for you as it most commonly results in a rapid ascent to get out of the water which of course will bring on a bend. So, the medication is fine but the condition isn't until you are more stable. I am a qualified PADI diver and my fiancée would like to learn to dive, however when she went to a try dive session she was advised that she probably wouldn't be able to get a medical signed off because of the medication she takes. She is taking Stelazine 5mg and Procyclidine Hydrochloride 5mg once per day. This is to counteract a dopamine deficiency. She is aged 42, otherwise in good health and does not smoke. The type of diving we would do would be warm water, Red Sea, Caribbean, and possibly some summer UK (when hot!) and not exceeding 18m depth, mostly a lot less as nearly all the pretty stuff can be found in the first 10m. We are both fairly cautious in nature so we would not intend to 'push the envelope' in taking any risks or intensive diving, tight surface intervals etc. I would be very grateful if you could advise me whether it would be safe for her to dive as described above and whether it would be possible to obtain a diving medical certificate when taking this medication. I think its going to be difficult to get her signed off to be fit for diving on this drug combination and also for what it is used to treat. Stelazine is a powerful tranquillising drug used for treating severe anxious, psychotic and depressive episodes. It also has side effects similar to Parkinson's Disease, for which the procyclidine is given to counteract. Stelazines tranquillising action will inhibit her ability to respond in critical situations endangering both herself and her buddy, and if this were added to any narcosis then a fatality could happen. As she is on this treatment for a major psychiatric episode, then this in itself would bar her from diving too. I suggest she sees her psychiatrist to find out how long they think she needs to take this treatment, and if ever she is off it then a diving doctor would need a clear letter from her psychiatrist that she has fully recovered before passing her as fit to dive. I am attending the pool session tomorrow for my OWC but have a few issues. I answered 'yes' on three questions from my medical questionnaire. Firstly regarding my sinus problem that resulted in sinusitis quite a few times, which I was told is caused by a deviation of septum. Had problems with it in the past, at the moment it seems OK. My nose seems clear and the Eustachian tube seems clear. Second 'yes' was regarding a minor back problem that seems to occur only after I lift heavy weight. The third issue is recreational use of drugs. I occasionally use cannabis. Last time I have used it was a week ago. I do not drink alcohol or smoke cigarettes, and when using cannabis I either vaporize it or take it orally. I am fully aware to avoid using it long before any diving activity as it could put at risk my safety and safety of the others. I would be most grateful for your reply and opinion regarding my attendance of the pool session tomorrow. If not, I can easily reschedule it. Lets go from the top. If you can clear your sinuses on aeroplanes, then you should be fine diving. A really deviated septum will make the air you blow up your noses to equalize your ears asymmetric. This may result in over blowing one middle ear and not enough in the other. Result.. a weird feeling as you descend. So that needs checking before the open water dives, but if it seems OK, then it will probably be OK. Your back could be an issue if you cannot lift a tank. If it "goes out" so to speak then you don't want spasms underwater. You have to test it really and know your limits. So try with rucksack home from the shops with a load of your favourite things. 20 kilos of skunk, perhaps. If you can do that then you have no fears on the big day. Recreational drugs. In my day that used to be crystal meth, hearts and someodd stuff a PhD chemist used to call Crazy Ivan. But trends change with you young things nowadays. Cannabis has 3 downsides. Psychosis, growing breasts if you are a bloke and irritating conversation for those who have not partaken. I would suggest you don't have any for a good 12-24 hours before you go for a dive. After all it's dangerous to giggle through a reg, and fish don't sell Snicker bars. Is it safe for me to dive whilst taking Roaccutane (Isotretinoin) tablets for my acne? If not how long after finishing the treatment before I can dive again? If I am able to dive whilst on this medication should I look out of any specific side effects? For those not in the know, this is serious anti-acne treatment. So strong it can only be prescribed by named dermatologists. It basically dries up any oil production by the sebaceous glands on the face. It also dries all the mucous membranes of the body. That’s eyes and mouth. So the only downside with diving, where your mouth can get pretty dry with the regulator, is super-dryness there. You may have to peel your tongue and lips of the rubber of the mouthpiece. But hey! - at least that means it’ll stay in place when you are underwater. You can dive on this medication- just don’t have babies on it, it’s a powerful teratogen. I find articles on health safety issues very informative and interesting, so I guess we owe you and your font of knowledge a big debt of gratitude. Well now all that obsequiousness is over and done with I have a health question for you. Just recently I have been diagnosed with... BPH (Benign Prostatic Hyperplasia). At 44 yrs, would the subscription of one capsule of tamsulosin hydrochloride 367 micrograms per capsule affect me in any way as I have not dived for 18 teen months. Please can you advise. As we head into the dank winter months a bit of blatant ego massaging never goes amiss, so thank you for your kind words. 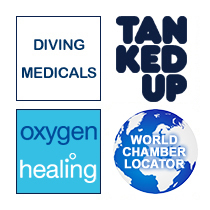 I have a few for you too: you can happily continue to dive with an enlarged prostate. There are, as usual, one or two caveats. The profound diuresis (increased urine production) that immersion in water induces can become more problematic with existing BPH, so take care to empty your bladder before and after each dive (and preferably not during, unless you’re wearing someone else’s wetsuit of course). Tamsulosin, or “Flomax” (its deliciously literal trade name), can cause significant nasal congestion, so you’d be wise to make sure you can equalise properly in the shallows before leaping into the depths. It can also drop your blood pressure, which shouldn’t be an issue unless your BP is low already, in which case it may cause you to feel faint or short of breath. Again, a few cautious shallow dives should highlight any impending problems or susceptibility to this. I'm a GP and I'm getting more and more people coming in with dive medical forms asking me whether this or that drug is okay to dive with. A lot of them are older and are on more than one medication. Is there a list somewhere of what is safe to dive with and what isn't? No, but I wish there was, it would make our lives a lot easier. These sorts of questions are very common, but very few medications have been tested for problems under pressure. So there’s often no simple answer. For a start, every drug affects every individual differently: the Lariam one diver takes with no problems may give the next vivid hallucinations and psychotic nightmares. What is the condition the medication is needed for? Sometimes the dangers of that are far worse than any medication side effects. On that note, are any of the side effects likely to be of concern? Sedation, nausea, dizziness or a tendency to bleed are just a few of the possibilities. Multiple drug combinations get more common with increasing age, and the unpredictable reactions these produce could be fairly catastrophic mixed with nitrogen at depth. So best advice is to consider all the above, and if you can’t come to a conclusion, send your conundrum to someone like me, so I can get a good headache mulling it over. I was born with a cleft lip and palate. I also have a hole in my nasal septum, and have had for around 4 years now. Being totally honest, I used to do cocaine and speed to excess in my London city life. Luckily I saw the light and moved on, and although I still drink and smoke too much, I have since never taken drugs. I was wondering if either of these will cause me problems when diving? Dealing with the drugs issue is easy – diving and drugs don’t mix, just as they don’t with driving or any other activity that involves sharp mental agility and focus. Alcohol and smoking could arguably be considered in the same drugs category, so minimising your intake of both would be sensible. The physical abnormalities in your nose and palate do present a couple of practical difficulties. To breathe through the mouth alone, we compress the base of our tongue against the back of the hard palate, closing off the nose. With a defect in the palate, this manoeuvre is pretty difficult or impossible. Thus breathing through a regulator with your mask off (an essential skill in diver training) will cause water to be sucked into your nose, and much gagging and coughing will ensue. I think a trip to the ENT doctor would help clarify whether your palate and nasal passages can be patched up (they can insert all sorts of plastic prostheses these days). Your only other option would be to use a full face mask.